God tiles, with Ra in the center. Ra tiles can be good or bad, depending on where you are in the epoch and what you want to happen. Regardless, they always mark an auction and that time is marching on. Egypt can be a brutal land. State funerals, war, drought, and destruction seem around every corner. But for you, an enterprising auction participant, luck is on your side. You will bid for the best the kingdom has to offer and store your goods before the sun sets on your empire. You can’t take it all with you, but if your building projects go as planned, your fame can last forever. The sands of time will blow and accumulate. Will your dynasty be remembered? Find out in Ra! 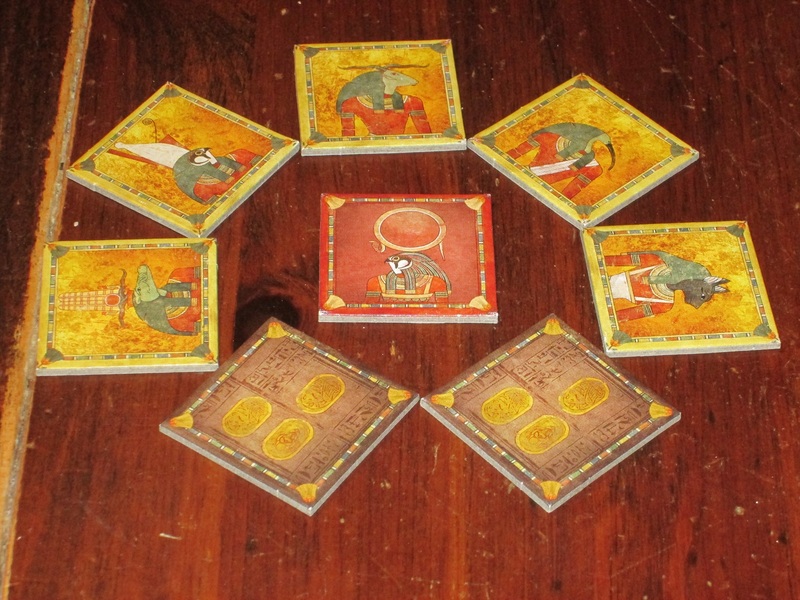 Ra is an auction/set collection game for two to five players. Players try to collect the highest-scoring batch of tiles over three epochs. The player with the most points wins. Ra set up for four players. To begin, players get a randomized set of sun tiles. (The set values follow a chart in the rulebook.) 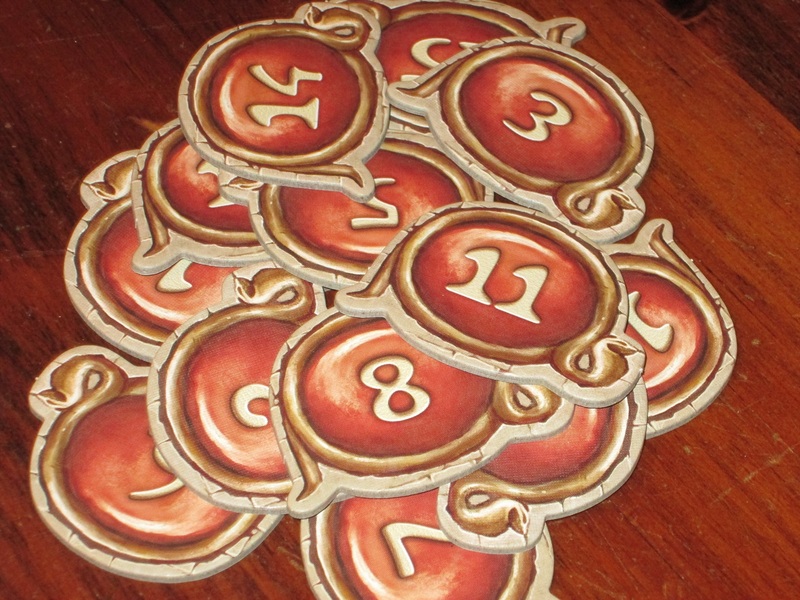 Players mix the game tiles in the bag, place the board in the center of the table, and take 10 points from the supply. The player with the highest sun tile begins. Draw a tile from the bag, adding it to the appropriate track. Use god tiles to claim tiles from the auction track. 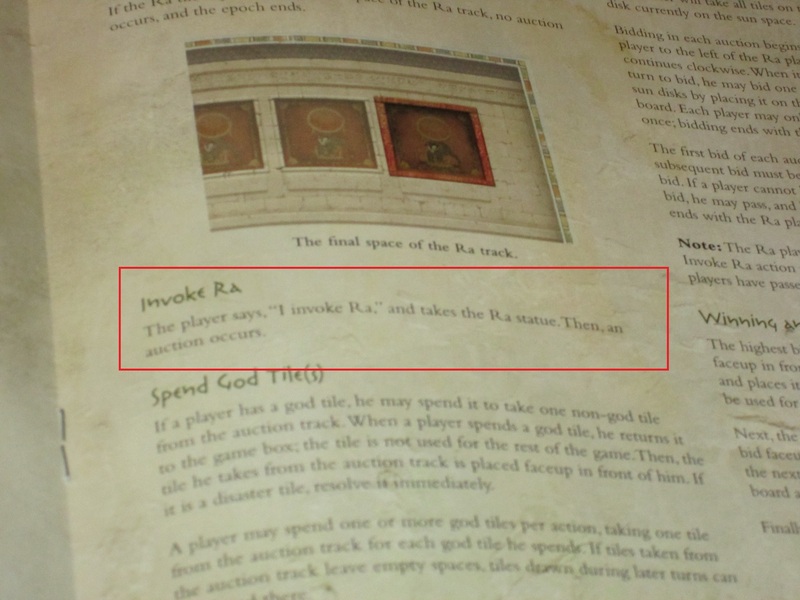 There are two tracks in Ra: the Ra track and the auction track. Any non-Ra tiles are added to the auction track; Ra tiles are added to the Ra track. The epoch ends once the Ra track fills up with tiles, and after each Ra tile is drawn, an auction happens automatically. The instructions have a helpful table that’s easy to access, detailing which suns form each group. This ensures an equitable starting point. Whenever an auction happens, the player who called the auction or drew the Ra tile takes the Ra statue, and each player in turn order may bid one of their suns, ending with the player with the Ra statue. The player who plays the highest sun gets everything on the auction track and exchanges the sun tile bid with the sun tile in the center of the board. 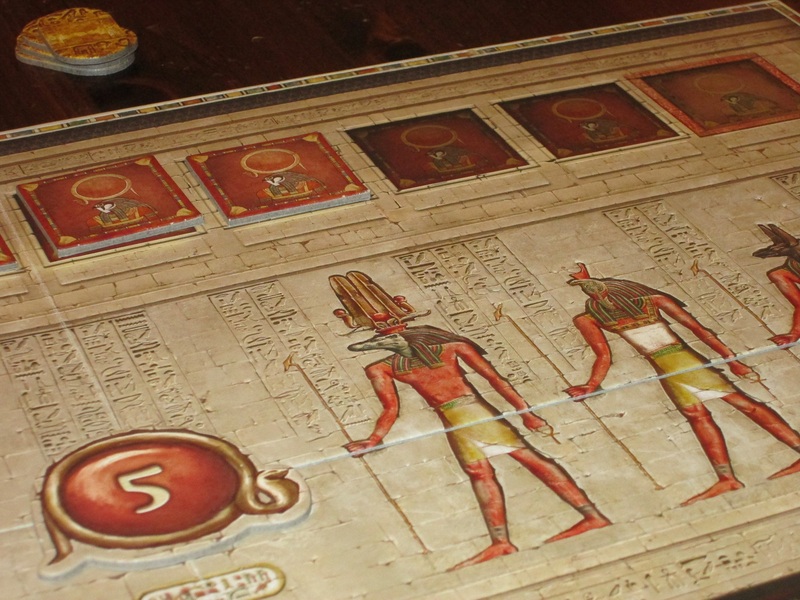 There are several different kinds of tiles in Ra, and they all score points in different ways. God tiles and gold tiles are worth straight victory points and are discarded at the end of the round. Nile and flood tiles are worth 1 point apiece, but only if the player has at least one flood. Civilization tiles grant points only if you have several different kinds, but if you have none, you lose 5 points. Whoever has the most Pharaoh tiles gets 5 points; whoever has the fewest loses 2. Monument tiles are worth nothing during the game but score at the end of the game based on how broadly and deeply they are collected. And disaster tiles, when they are won in the auction track, force a player to discard two tiles matching the disaster shown. 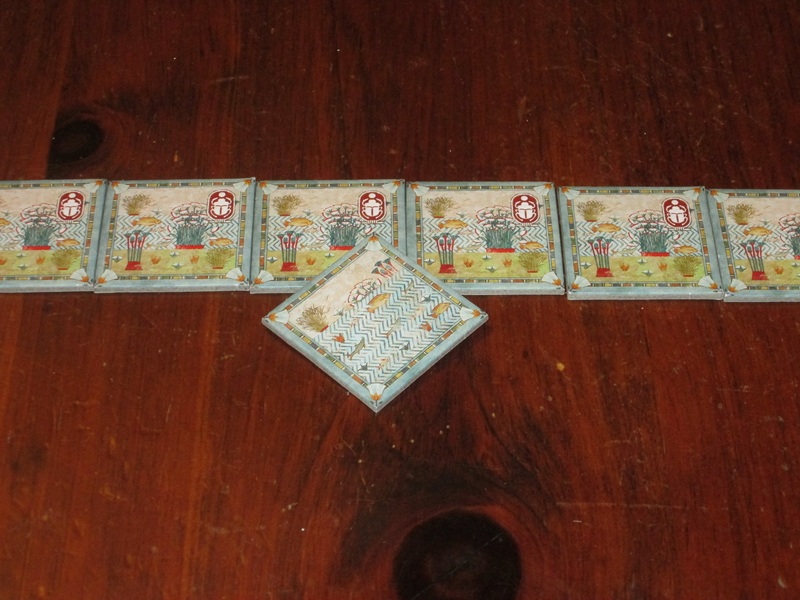 The game includes double-sided player aids that remind players how the many different kinds of tiles score points. 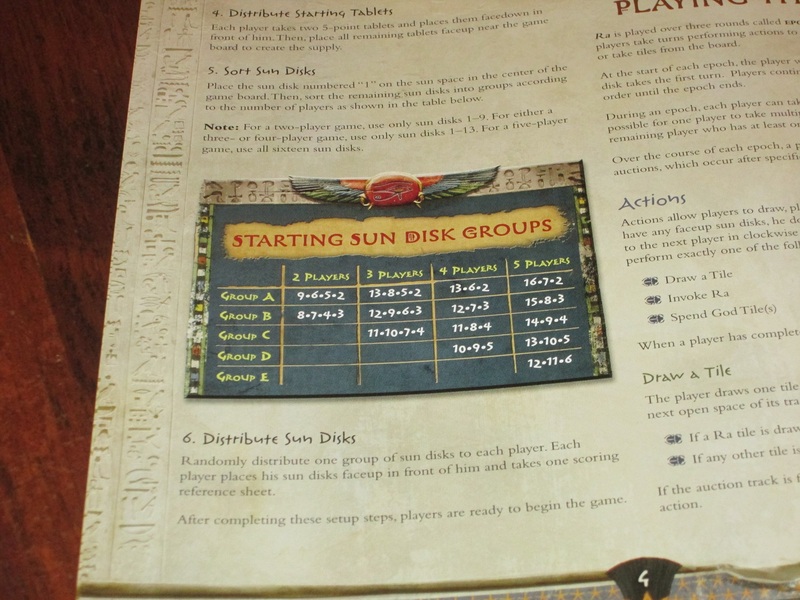 Once a player has used all his or her suns in an epoch, that player doesn’t take any more turns until either all players have used their suns or the Ra track fills completely. In either case, the epoch ends, the auction track is cleared, and players score points for the tiles they’ve collected. Any tiles that don’t have a scarab icon are removed from the game, and a new epoch begins. After the third epoch, players score points for that epoch as well as their monuments. The player with the highest sun total gets 5 points, and the player with the lowest total loses 5. The player with the most points wins. Forever King, or Embalmed and Entombed? 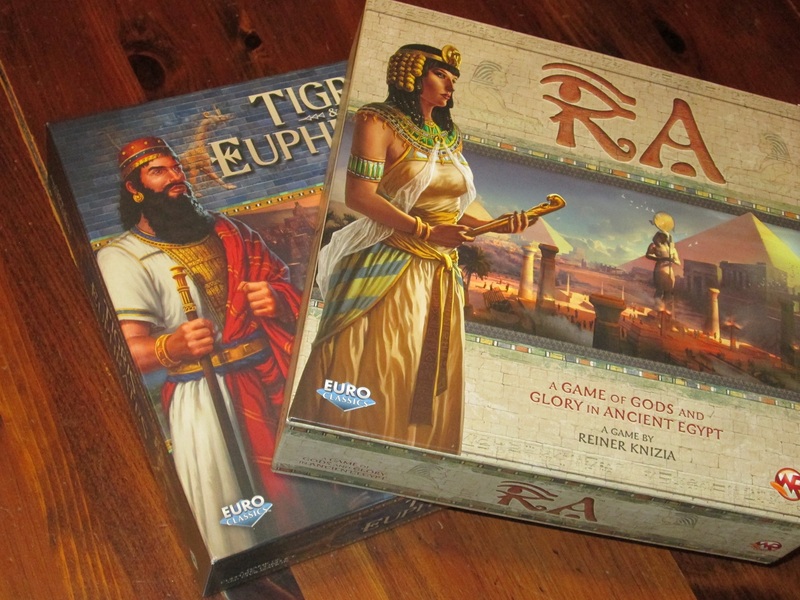 If you’ve followed me or my reviews for any length of time, you probably already know that Ra is one of my favorite games (currently #5 in my top ten games of all time and #1 in my top ten games by Reiner Knizia). But I’ve always been a little dissatisfied with my earlier review of the game, for two reasons. 1) I had played the game only five or ten times when I wrote that earlier review, and 2) @Futurewolfie contributed his opinion to the review, and it’s wrong. So, with a new edition comes a chance for a clean slate and also a chance to review the game after 25 or so plays. And let me tell you, like the Great Pyramids, it just gets better with age. 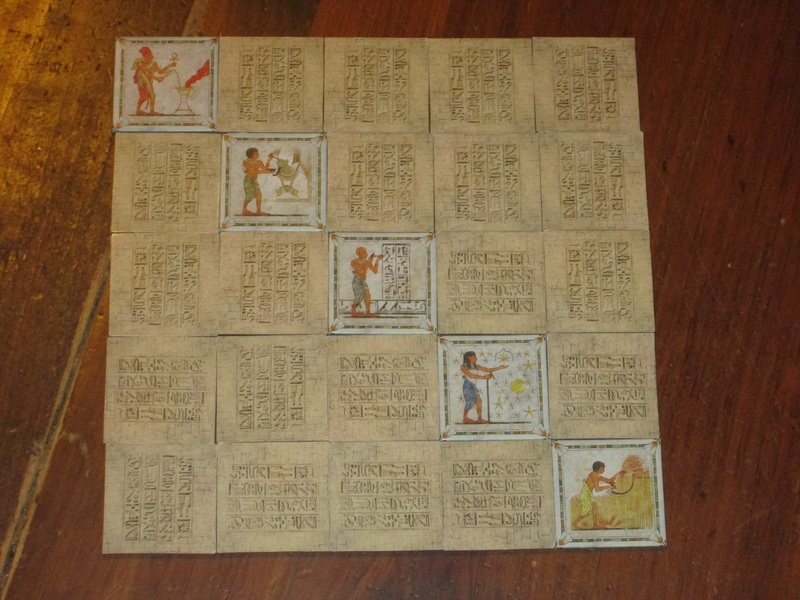 The game board for this edition of Ra is EMBOSSED. I tried to capture this effect on camera. It’s stunning in person. 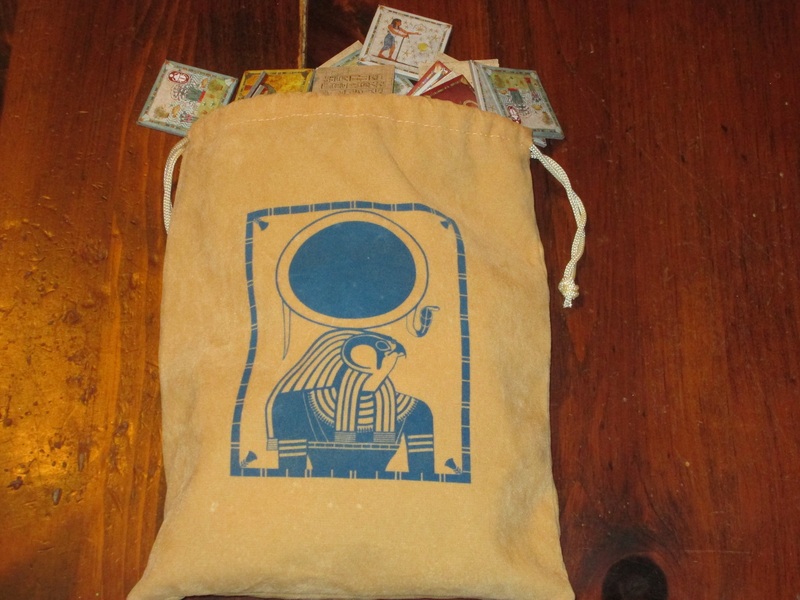 Ra is an auction game, which tells you already that the game might have a limited audience. Like most auction games, the tension is built around different lots being worth different things to different players. (This aspect is even more dynamic in Ra, given the many different types of tiles.) 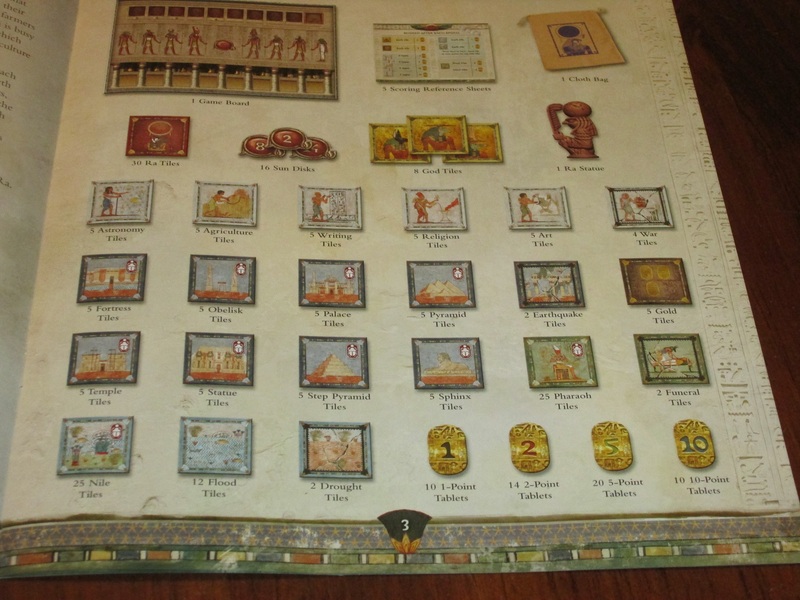 But Ra is different from most other pure auction games in that the main currency for the auction does not determine the winner of the game. In Medici, for example–my second-favorite game by Reiner Knizia–players bid florins for each lot of goods to load onto their boat, but the goods are also worth florins, and florins determine the victor. So players have to evaluate 1) how much the goods are worth, and 2) how much they should bid to get their money’s worth. If they misguess, they’ve cost themselves victory points, essentially. New players often complain about auction games because they don’t know how to properly value the lots, and this puts them at a disadvantage since the bidding currency and victory points are the same. The bidding currency in Ra is separate from the victory points, which relieves some of the burden of auction games on new players. There are plenty of other wrinkles here, though. The innovation in Ra is quite simply a work of genius: there is a separate bidding currency. Players hold a number of sun disks in front of them, and they can clearly see where they stand relative to other players in what they might be able to bid. These sun disks are not victory points (although points are awarded at the end of the game based on high and low totals), so players have less worry about costing themselves the game through brash bids. But the real genius of the sun disks is that they keep players focus on the auction track and make Ra less about value and more about timing. The Ra statue marks who called an auction. Here Ra is sitting in a pile of victory points. YES PLEASE. 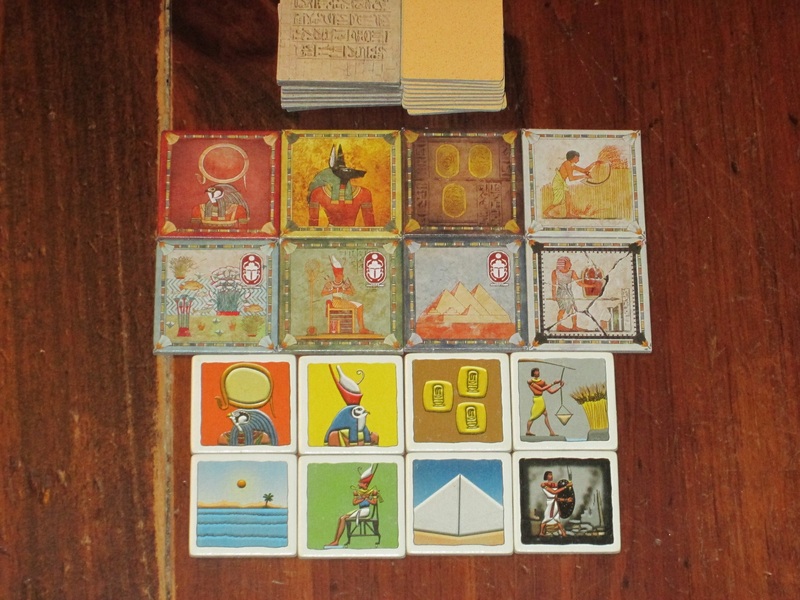 These “guerilla” auctions caused by the low suns are helped along by the Ra tiles in the bag. In addition to providing the timer for the game, each time a Ra tile is drawn, an auction happens automatically. It’s easy to telegraph your intentions in Ra, so the Ra tiles provide a nice cloak to hide behind. “I had to call this auction,” I might say, when in my heart I am thinking, Don’t bid; please don’t bid. Let me get this for a song. The Ra tiles also form the backbone of what elevates Ra from what could be a dry and dusty Euro to one of the most exciting gaming experiences I’ve had. 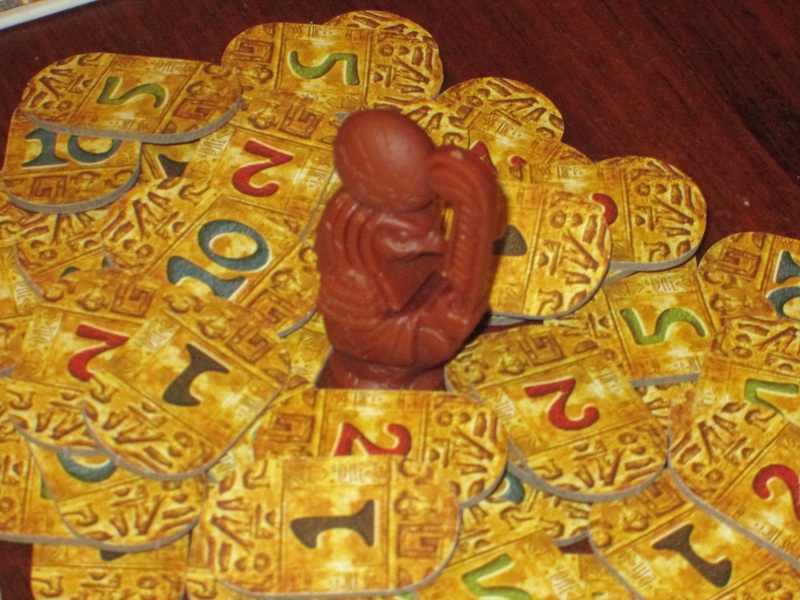 Because more than just auctions, Ra is a game with a heavy press-your-luck element. Ra tiles are the most prevalent type in the bag, and Ra tiles could come out at any moment. When the epoch ends, it ends immediately without auction, so players have to weigh how much they’re willing to risk to stay in the game. Huge benefits can accrue to players who stick around until the end of the epoch, but if this happens after many Ra tiles have come out, the last person has to be careful lest he or she leaves empty handed. I mentioned that the high suns are a huge responsibility, and this especially comes into play as the round goes on. Again, if players with low suns are forcing auctions in the early epoch, longer tracks will usually be on offer later in the epoch, when the high-numbered suns get their chance to shine. But getting anything is better than getting nothing, and this becomes an excruciating decision as the epoch rolls on, especially when other players are cheering for your downfall. I’ve seen players get a windfall and I’ve seen them go bust. Either way, it’s fun to watch. The Ra track shows how close the epoch is to ending. Players better get their bids in quick–the epoch could end sooner than they’d like! The simple act of drawing what’s being auctioned from a bag provides nigh endless replayability because the order tiles come out matters a great deal in Ra. If Ra tiles are drawn early in an epoch, it forces players to adjust their bidding to get tiles while they can. If few Ra tiles come out early in the epoch, players can be more choosy about what they claim from the auction track. In either case, this affects later epochs as well–a short epoch now will likely make for a longer epoch down the line. Drawing tiles from the bag also makes each draw exciting, as each draw is a reach into the unknown. You may be hoping that the tile you need gets added to the track to make it worth bidding, or that a tile you don’t want your opponents to have doesn’t enter the track. You can consider the probabilities of what you draw based on what you’ve already seen, but probabilities aren’t certainties: there may be only one Ra tile in the bag among ten or twenty others, but there’s no guarantee you won’t pull it. And then there are disaster tiles, which affect the value of the track. These can dramatically influence what players are willing to bid, and they’re also often situational: the funeral disaster won’t hurt the value of the track for the player who doesn’t have any pharaoh tiles. 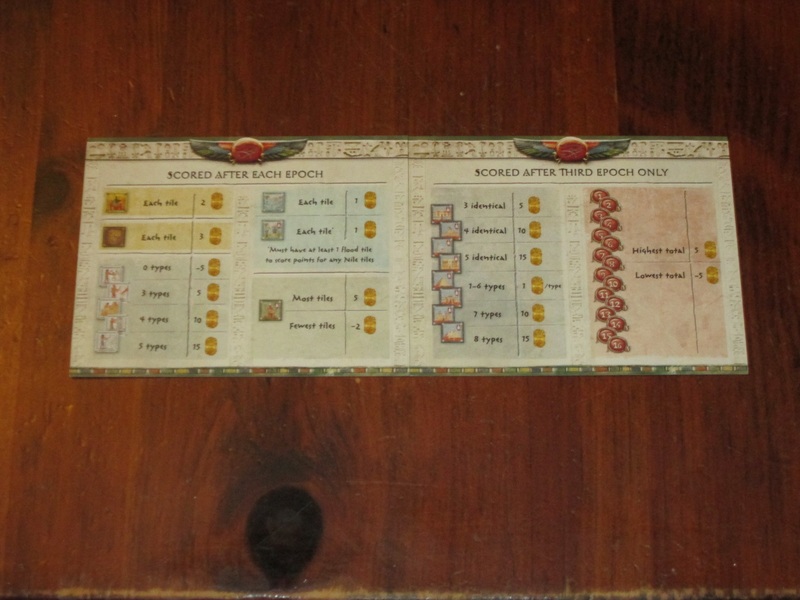 What makes this most interesting is that civilization tiles–which aren’t worth much on their own but cause players who don’t have any at the end of the epoch to lose 5 points–are the most volatile: for each other type of tiles, there are two disasters; for civilization tiles, there are four. Because of the vagaries of the track, having a god tile in your back pocket can be a huge boon. God tiles are worth two points at the end of the epoch, but you can also use your turn to discard any number of them for tiles in the auction track. This can help you rescue tiles from the clutches of imminent disaster or simply keep you from having to bid high on a track that’s mostly worthless. God tiles can be very effective, but once you’ve spent your suns, you’re out of the round, so players have to gauge when the most opportune moment is to use them. The tile manifest in the rulebook. There are 180 tiles included in Ra, yet they all balance beautifully. As I think about what makes Ra so great, it all comes down to how clever it is and how balanced the trade-offs are. Each bid is a trade-off: you forfeit one of your chances to bid later by taking what’s available now. (The bird-in-hand versus two-in-bush conundrum.) In the process, you also exchange what you used to bid with the sun disk of the last bidder. So not only do you have to consider the value of the track, you have to consider what your bid now will do to affect your later game. And since it’s easy to see where your bidding chips fall in relation to others, you’re constantly having to assess demand to determine that you get the maximum value from each of your suns. And you also have to consider which tiles will disappear at the end of the epoch (one-and-done scoring) versus what tiles will provide steady points income through the game. This whole system is absolutely brilliant, especially in a game with as few rules as there are in Ra. I can teach Ra in around five minutes, yet even after twenty-five games, I still learn something or see something new in each play. The box says the game can be played in 30-60 minutes. I’ve never seen a thirty-minute game, but I can usually teach the game to new players and play a full game comfortably in a lunch hour. And it’s satisfying every time. Disasters can strike at any moment, as can Ra tiles. These can all be situationally good or bad, depending on what you’re going for. But they are always interesting. Not everyone loves Ra, obviously, and while for me it’s a clear 10, there are some things you should be aware of. First, as simple as the rules are to understand, knowing the best course of action takes practice. Ra is a sometimes brutal game, and huge gaps in score are not unlikely. There are few safety nets to rescue players from poor play. (In one recent game, scores were 50-49-48…26. That bottom score was from someone who was playing for the first time.) What the game gives with one hand (longevity! rewards for experienced players! ), it can take away with the other (demoralizing losses!). Most new players, even if they don’t play well, still have a good time–the core of the game is fun, they can generally understand what good play is (even if they can’t seem to pull it off), and scores are kept hidden until the end of the game–but the experience gap is real. Civilization tiles are hard to score points with, but they can keep you from losing points. If you end an epoch without one, you lose 5 points! Ra is also not very thematic in the sense that you don’t feel like you’re participating in building Egyptian dynasties. I love the Egyptian window dressing, though, and the story for the tiles makes sense. (The game spans 1500 years–it makes sense that monument tiles stay while gold goes. It makes sense that Nile tiles only score when you have a flood: in a harvest economy, you’re dependent upon the rains.) 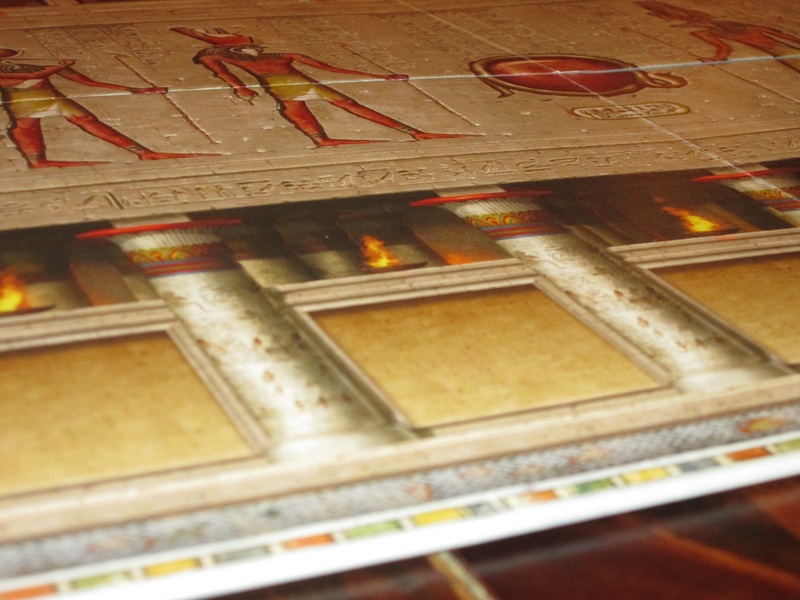 But if you want a more thematic Egyptian game, you can find it in the Knizia classic Amun-Re. Here it’s just for decoration. Monument tiles only score points at the end of the game, but they score points based on how many different kinds you have and how many of each kind you have. 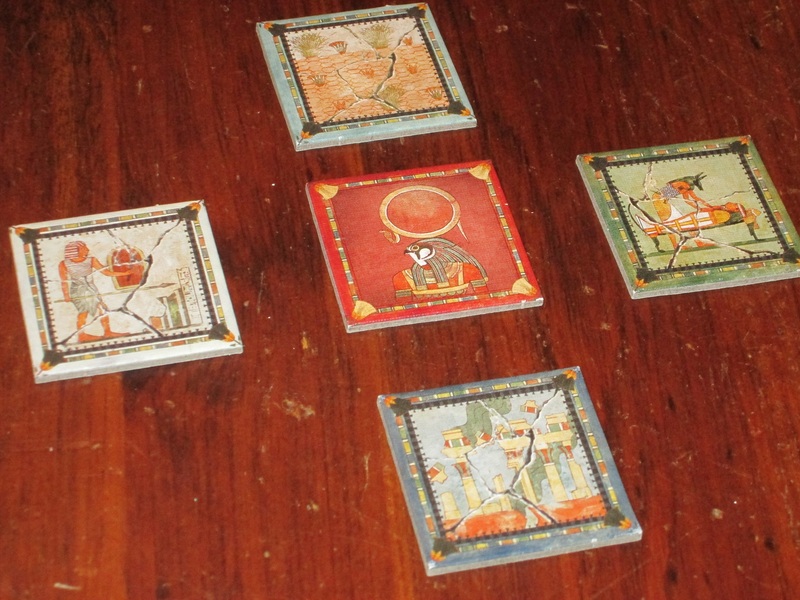 Nile tiles can score you lots of points…if you can get a flood tile. Niles without flood tiles do not score at the end of an epoch. Ra is just even better today than it was when I received it for my birthday five years ago. And despite originally being released in 1999, it still feels fresh seventeen years later. (I know because I keep introducing people to it who don’t know or care when it was released, and it stands up well against more modern titles.) 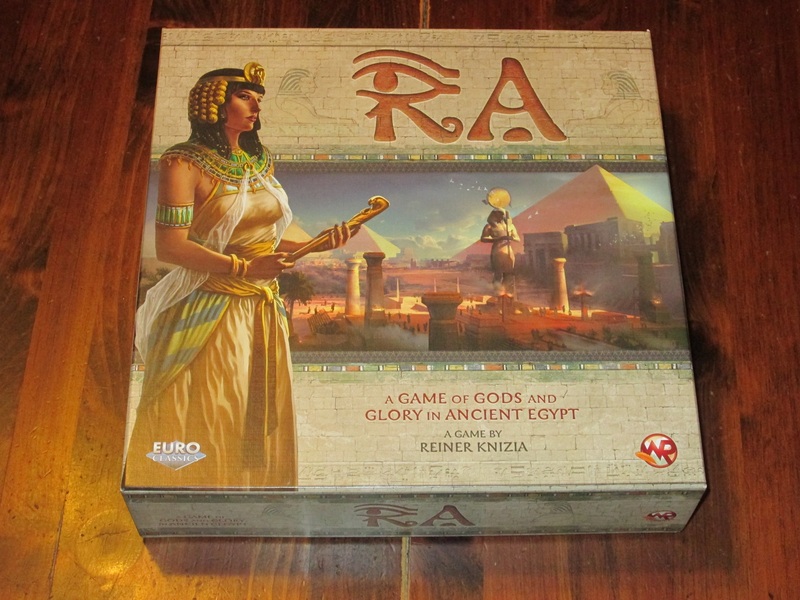 Aside from Knizia’s own reworkings, there just hasn’t been another game like Ra. Each game requires a fresh perspective because of the variable order the tiles come out and especially the timing of Ra tiles. Each game is tense and exciting, and because of the press-your-luck element, players are invested in the outcome even when they’re out of the round. 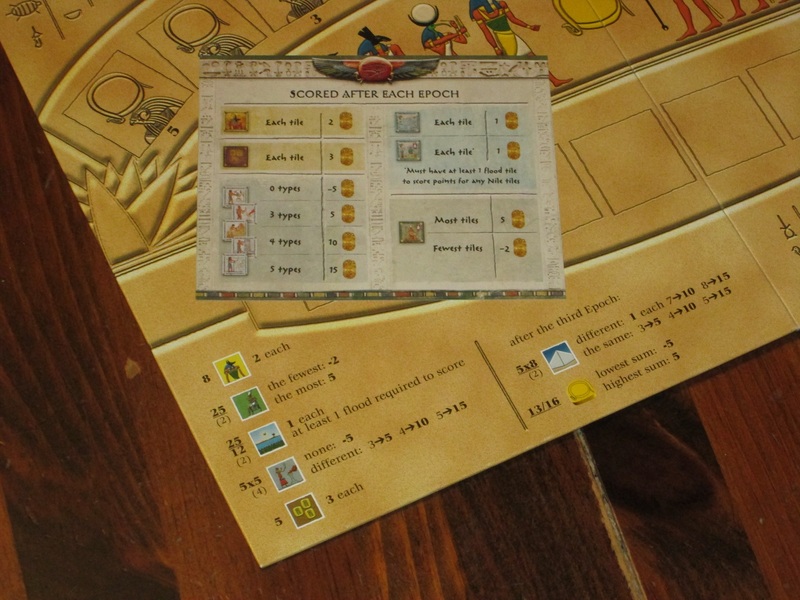 Ra is truly an achievement: a game that harnesses the excitement produced by luck and creates a compelling strategy game around it that rewards experience while simultaneously having a low barrier for entry. I’ve thoroughly enjoyed my first twenty-five plays, and I eagerly await the next twenty-five. I received the Rio Grande edition of Ra for my birthday five years ago, and since then it has been in frequent rotation. My copy is well loved, and there’s a lot of nostalgia surrounding it, so I was not too excited about a new look for the game (although I was glad to see that more players would have a chance to play it). WindRider Games has taken several Knizia classics and repackaged them for a modern audience–Tigris & Euphrates, Samurai, and now Ra. I wasn’t excited when I saw the look of any of these when they were first announced. But after playing with them, in each case, most of my misgivings melted away. As with the others, I’m not sure I prefer all of the new component choices in this edition of Ra, but anything that isn’t an upgrade is more a step to the side than a step down. 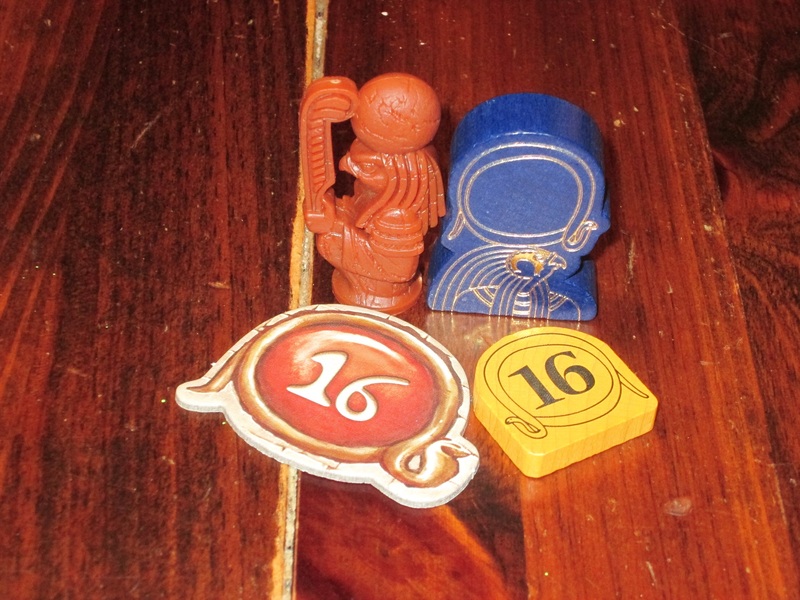 The suns and Ra statue in the WindRider edition are cardboard and plastic, respectively, rather than the chunky wood of the Rio Grande edition. I still prefer the wood, but this surprisingly did not affect my experience much. The most obvious place you might see a “downgrade” is in the sun tiles and Ra figure. When I saw that instead of wood these components would be cardboard and plastic, respectively, I thought there was no way I would like them as well as the old ones. In fact, before the first game, my coworkers and I griped about how different and subpar they were. But as soon as we started playing, these gripes disappeared–they no longer mattered. We were too engrossed in the game. Would I still prefer wood? Yes, I think so. But that the suns are cardboard or the Ra figure plastic is not nearly as big a deal as I thought it would be. The sun tiles are larger than before, and the Ra figure shows more detail, so they are in some ways better. I do still prefer the heft of wood, but the choices here don’t bother me in actual play. The new fame tablets are a HUGE upgrade. More readable, larger, thicker. The new tiles and the old. The new tiles are thicker and larger, although some tiles are harder to distinguish than in the old edition. The tiles in the new version are an artistic and quality upgrade, but it is harder to distinguish some tiles from across the table. 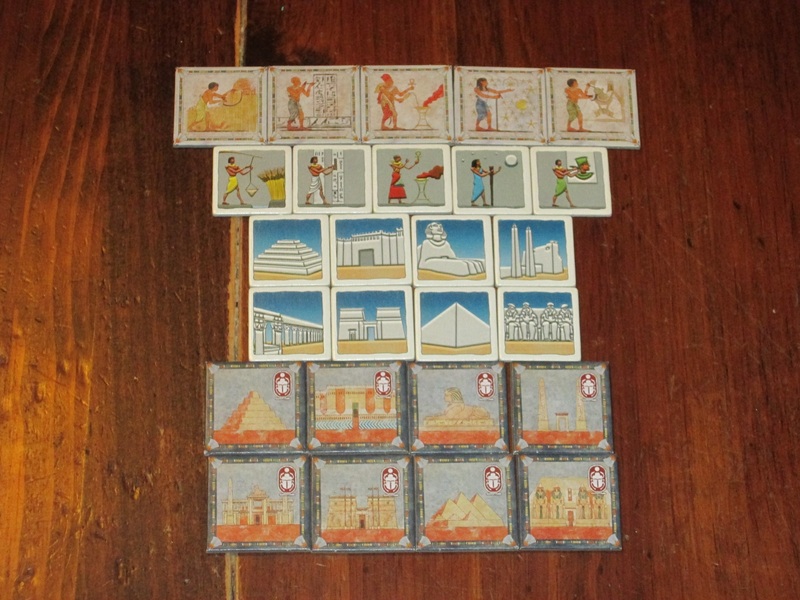 The monuments and civilization tiles, for example, had clearer, less cluttered pictographs in the previous edition. Here they all look somewhat similar. Of course, some of the monuments were hard to distinguish even in the old edition. Legibility aside, everything else about the WindRider tiles is better. They are much thicker and also larger, making them easier to see and more satisfying to have in front of you. The art on them is gorgeous if a little less bright. The god tiles and gold tiles just look like they should be worth a lot. And the addition of a scarab icon to tiles that remain is especially helpful for new players while also being unobtrusive. Even the backs of the tiles are gorgeous here. The new tile bag. Not pictured: the old tile bag, because I pitched it. It was far too small to hold the tiles. This is a better material and better size, although I wish even this one was a hair larger. The tile bag is nicer as well, but what’s slightly baffling is what a missed opportunity it is. 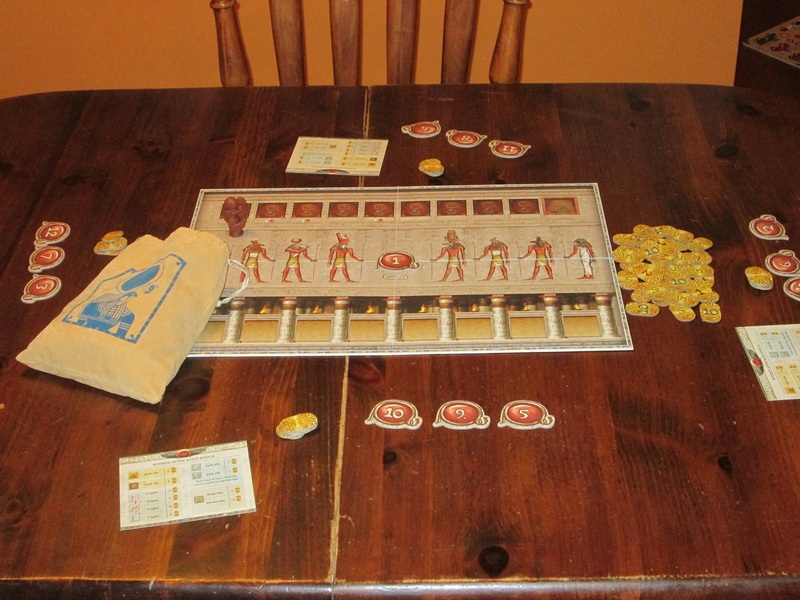 The tile bag in the last edition was my biggest gripe about it: it was too small to hold all the tiles and allow for good shuffling, at least in the first epoch. (I have long since replaced my old bag with a custom one.) The bag in this new edition is bigger and has nice screen printing on it, but since the tiles are also bigger, it doesn’t result in much net gain. I’d still choose this bag over the last one, and it is a better size relative to the tiles, but it’s a bummer that this is still an issue. The old board folded on the new. The new board is quad-fold, embossed, and larger. The game board is perhaps the thing that provides the biggest wow factor in the new edition. It maintains the clarity of the tracks while beautifying the board in both subtle and more ornate ways. The subtlety is that the board is embossed. ?!?! That’s right, the board has slight elevations that hold tiles in place on the tracks. The embossing also makes the new, more ornate illustrations pop. It’s hard to overstate just how cool this new board is and how great it looks on the table. Each player gets their own player aid in the new edition, although the new player aids do not say how many of each tile are in the bag. Sad! Along with the new board design, the game now includes individual player aids to make the board less cluttered. I do appreciate these, and they are especially helpful when teaching, but they leave off one key piece of information included in the older edition’s table: how many of each tile are in the bag. It’s in the rulebook, but the whole point of having a player aid is to keep the rulebook off the table. I’ve played enough times that I just fill new players in, but this seems like a significant oversight. I suppose even this is just a minor annoyance, but it is frustrating not to have the numbers handy for reference. The biggest travesty of the new edition. … Okay, it’s not that big a deal. But this seems much more sterile than the older edition. The worst part of this new edition is the change in rules. Rather than loudly saying, “Ra!” when an auction is called, the WindRider rules encourage a more formal and sterile, “I invoke Ra, good sirs and madams.” (Okay, the last part isn’t in the rulebook.) This isn’t really a big deal, but the first time I said, “I invoke Ra” to veteran players, they wouldn’t acknowledge my calling for an auction until I slammed the figure down on the table and put some oomph behind it. 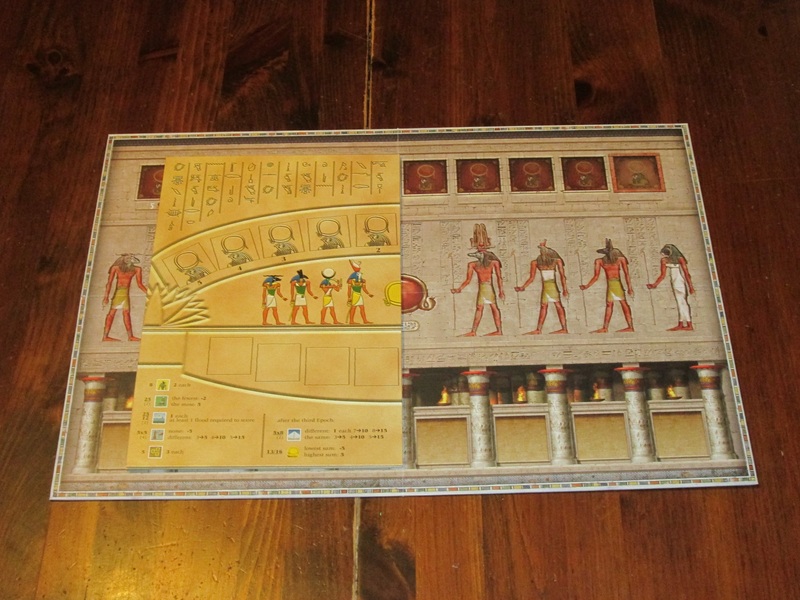 And that’s kind of the difference in the versions: the older version is brighter and more cartoonish, perhaps reflecting the jovial mood while playing, while the new version looks much more thematic and gives off a stronger “ancient Egypt” vibe (and looks beautiful while doing so). There’s something to recommend both looks. 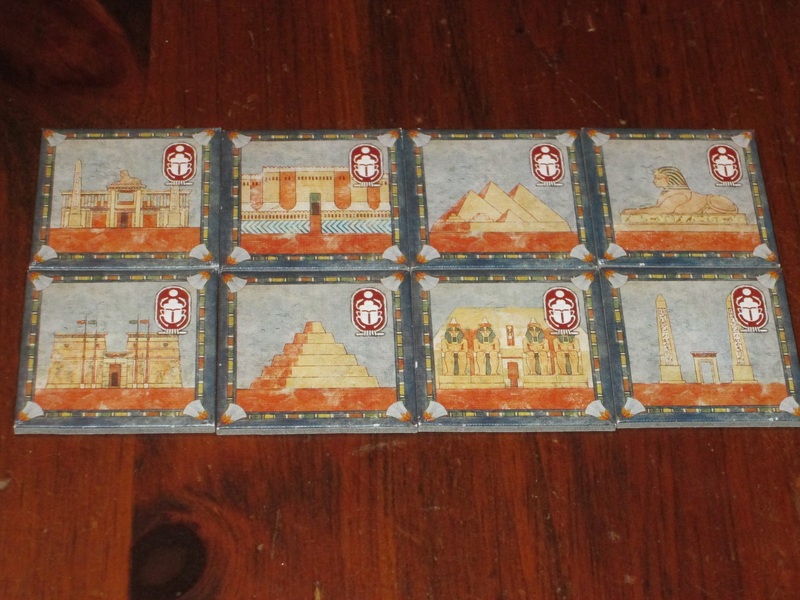 The monuments and civilization tiles are the hardest to differentiate in the new edition. The old edition is easier to read here. The question my friends have asked me, knowing how much I love Ra, is which edition is worth keeping? For me, it’s really a choice, since I now have both, and the rules (although laid out differently) are the same. For you, the answer is clear: if you don’t have a copy of the game, get whichever copy is available. Surprisingly, I give the edge to the WindRider edition, and that’s the version I intend to keep. It looks better, and the things I like less (cardboard suns, plastic Ra) are not enough to outweigh the things I like more (scoring tablets, tiles, bag, board). Here’s a comparison of how Ra tiles stack up (!) next to other games. 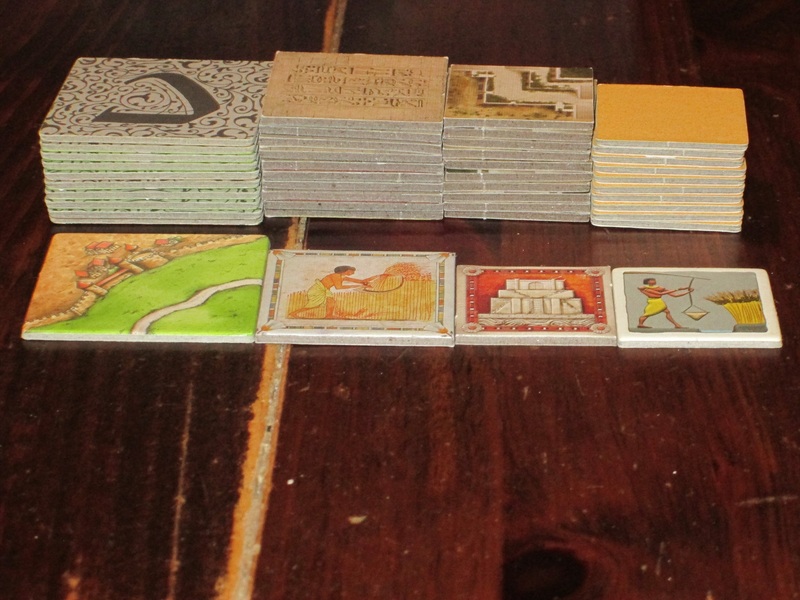 Included (left to right) are Carcassonne, Ra (new edition), Tigris & Euphrates (new edition), and Ra (old edition). I do understand the hesitation on price point for this new edition. The $59.99 MSRP is a bit steep, especially when people cry, “The old edition had wood and was cheaper!” And yes, that’s true. But the old edition isn’t cheaper anymore (it’s out of print), and there are a few things that justify this price, aside from natural inflation. First, there is a lot of cardboard in this game. Like, a lot a lot. 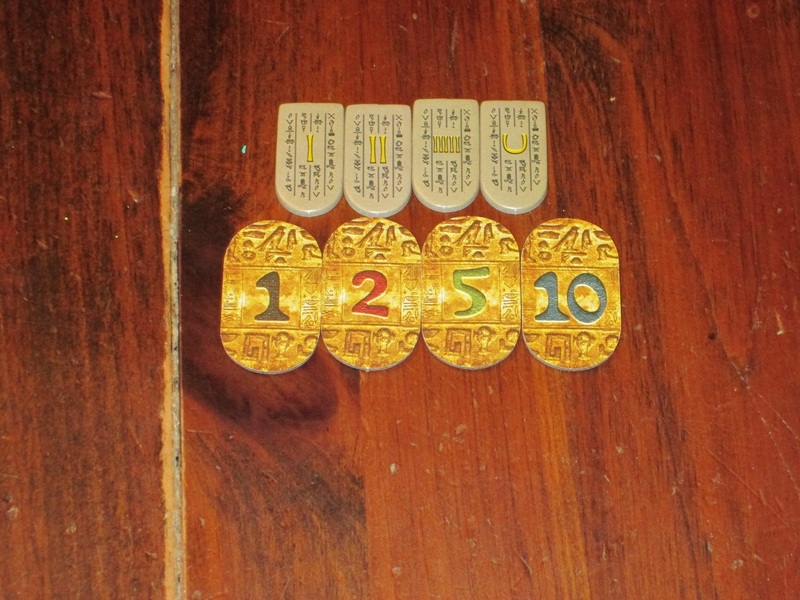 The game includes plenty of scoring tablets, sixteen large suns, and 180 tiles, in addition to the embossed game board. So the price, while steep, isn’t unheard of, especially given how indisputably better the cardboard build quality is here. This is a game made with care and built to last. And second, Ra is one of the absolute best games I’ve played. After 25 games, I still see situations I’ve never seen before, I still learn things about the friends around my table, and the game gets better and better. This is a game I haven’t tired of, and I doubt I ever will. It has already weathered seventeen years in a hobby enslaved to the cult of the new, and it only recently passed out of the top 100 on Board Game Geek. So from the price-per-play perspective, it’s a bargain at just about any price, even $50-60, considering that many more modern games reach their life span far before the 25-play mark. So my advice: If you own a copy of Ra, you don’t need this new edition unless you really like the new look better. Because Knizia doesn’t usually design expansions–and it’s a good bet that after 17 years, he won’t for this game–there’s no other reason to get the new edition. If you don’t have a copy of Ra, get it. If you can find an earlier edition for much cheaper (and the wooden components mean a lot to you), fine. If both are the same price, hopefully this review has given you enough information to make an informed decision. I didn’t think I’d love this new edition, given how much I love the original wooden components, but the Euro Classics line has once again proved itself a worthy successor to the old printings (and they look so nice together). Most of all, I’m glad that one of the best games ever designed is now available for a new and wider audience. 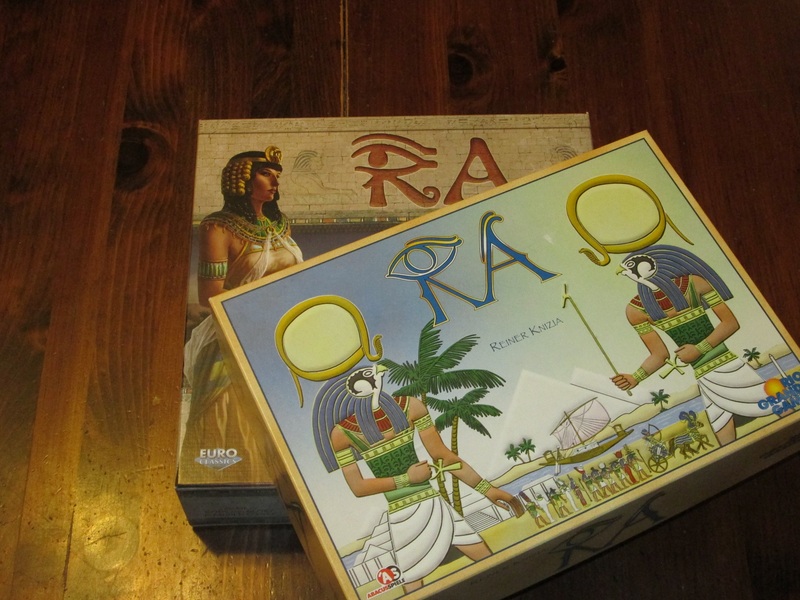 iSlaytheDragon would like to thank Asmodee USA for providing us with a copy of Ra for review.